A solid-supported catalyst that works at 60°C and atmospheric pressure could be integrated into power stations to remove CO2 from the flue gases and react it with epoxides to make cyclic carbonates, which are used as electrolytes in lithium ion batteries as well as environmentally friendly solvents and degreasers. 'Cyclic carbonates have been made commercially [using this type of reaction] for about fifty years, and are produced on a 100 to 200 kilotonne per year scale,' says Michael North from the Newcastle University, who led the research. He adds that current catalysts all require very pure carbon dioxide at high pressures and temperatures - around 180°C and anywhere from 8 atm pressure upwards. 'In an ideal world,' says North, 'we would take the dirty, wet CO2 that's belched out of the back of a power station, and react that with epoxides - without having to purify, pressurise and heat it up again.' He explains that, with a sufficiently stable and active catalyst, this should be possible since the reaction is thermodynamically favourable. But to be able to use waste CO2 from a power station, the system needs to work in a continuous flow reactor. This is exactly what the team has now demonstrated on the laboratory scale - they immobilised the catalyst on a cheap amorphous silica support and passed mixtures of CO2, nitrogen and ethylene oxide through it at 60°C. 'We were able to remove up to 98 per cent of the CO2 from the gas stream,' says North, although he adds that a more practical proposition would be to have reactors that only remove a smaller proportion of the CO2, since this makes the engineering side much easier to manage. Howard Klein, a Scientist Fellow at Huntsman Performance Products - the company that first developed catalysts for making cyclic carbonates and the largest producer in the US - was very interested by the technology. 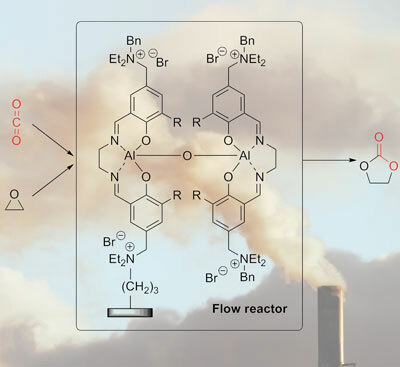 He explained that the potential for saving energy by reducing the temperature and pressure of their process and moving from batch reactors to a continuous process was appealing, but that the catalyst would have to be made very cheap to compete economically with the current quaternary amine systems. 'It's most interesting from the point of view of CO2 capture to mitigate global warming,' adds Klein. 'If you can get the CO2 for free or even get a credit for taking it, and then use it to make interesting materials that people need, then that could be an attractive business.' However, he points out that a limiting factor could be the price of the starting epoxides, which is the major cost of producing cyclic carbonates.